The Prodigy have revealed details of a track for their next album - which they admit will probably not to be until 2001. Liam Howlett and Maxim spoke to the Maker about their plans, which suggest they're in no hurry to put out the follow-up to their 1997 smash hit, "Fat of The Land". Howlett and 3D from Massive Attack have worked on the new track, which is provisionally titled "No Souvenir". "I've done a track with Massive Attack. It's the first one I've finished for the next album and it's come out really well. " The pair are also working on a soundtrack for "The Beach", but "No Souvenir" is not a part of that project. "No, it's not specifically for 'The Beach', " Howlett explained. Maxim from the Prodigy, now also pursuing solo career, was more blunt what The Prodigy are doing now. "F*** all! he told us. "No, well we've all been doing different things. I've been finishing my own solo album - there are two more instrumental tracks I need to do. It's totally my own thing, my own vibe, and doesn't feature anybody from The Prodigy on it. Skin's on there, as is Gangstarr, and I've also done a track with Sneaker Pimps. " He also explained why they felt the need to take such a long break. "On the whole, we just needed to take a long break for a while and chill out," Maxim said. "We'd been going for nine years without stopping and we needed to chill a bit. Instead of playing another Reading, another Glastonbury, with people getting fed up with us, we thought we should take a break and not exactly re-invent ourselves but find a different vibe we could use. If we were stupid and naive we could be playing now, but before we knew it we'd have damaged ourselves and become exhausted. "It's cool that so many people love us and want to see us live, but we wanted to come up with something new and exciting. We need to come up with some fresh visual ideas. I don't mean that we have to become theatrical. We're not theatrical. But we've always tried to look good. "I think the only person to rival Keith for constantly changing the way he looks is Ad-Rock from the Beastie Boys. It's not about being scary, it's more to do with conforming people with what you've got. " 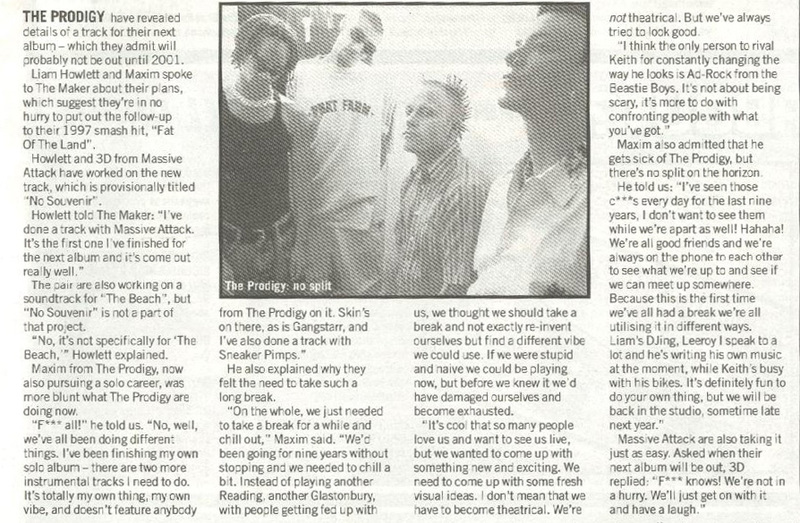 Maxim also admitted that he gets sick of The Prodigy, but there's no split on the horizon. He told us: "I've seen those c***s every day for the last nine years, I don't want to see them while we're apart as well! Hahaha! We're all good friends and we're always on the phone to each other to see what we're up to and see if we can meet up somewhere. Bacause this is the first time we've all had a break we're all utilising it in different ways. Liam's DJing, Leeroy I speak to a lot and he's writing his own music at the moment, while Keith's busy with his bikes. It's definitely fun to do your own thing, but we will be back in the studio, sometime late next year. " Massive Attack are also taking it just easy. Asked when their next album will be out, 3D replied: "F*** knows! We're not in a hurry. We'll just get on with it and have a laugh. "